This course will prepare you to work in a palliative/hospice setting regardless of your current/previous specialty experience. This course is very comprehensive and thus provides much of the content to help you prepare for the certification. I developed the RN certificate in palliative care course, and then I also teach in the APRN course. I think the reason that it’s so powerful is, number one, nurses want the knowledge about palliative care. But, number two, they want to have it on a time that’s convenient for them, and most nurses are busy, they’re working, they have families, they have lots of commitments in their lives. So, to be able to take time away to go to a class is difficult. But, you take something and put it in an online format, they can access it whenever they want, and it’s not just a self-paced course, it’s a course where you actually have an instructor in the course with you. So, you’re interacting with your instructor, and you’re also interacting with the other students in the class. I think probably the biggest myth is that it’s very complicated, and it’s very difficult, but it’s not, at all. It’s actually very simple. It’s very intuitive. Once you make it through the first week, it’s a breeze. I think the biggest difference, as an instructor, is that I’m much more interactive with students in an online format. If I stand up and do a lecture, I may have maybe a handful of students that will ask me questions or interact with me. But, put it in an online format, every single student I have an interaction with, plus I know about each individual student. They tell me who they are, where they’re from, what they do. So, I can tailor my education directly to that student. 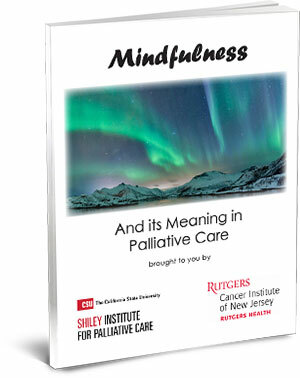 I think because we have palliative care programs popping up in hospitals all over the place, and there’s a lot of nurses that may have an idea what palliative care is, but they don’t know how to interact with their palliative care program. Or, maybe they’re a new nurse that’s just been, taken a job with a palliative care program, and they don’t have the background. So, they want to learn, they want to know what it is. And then, family members. They have family members who are chronically ill, they’ve heard about palliative care, they’re the nurse in the family, they’re kind of expected to know about everything, and maybe they don’t know, and they want to learn a little bit more. Well, I think it makes them be more holistic. It doesn’t matter if you’re a nurse working in dialysis. Actually, I’ve had a couple of nurses that work in dialysis, and they see these chronically ill patients all the time, but they don’t know what to do with them, and how to have those conversations about what next. And so, I think no matter what kind of nurse you are, and what area, you’re going to see patients who could access palliative care, and it’s not something we were necessarily taught in nursing school. The focus is on telling nurses what hospice and palliative care is, and then we talk about pain management and symptom management. That’s really the bulk of the course, really looking at, how is management of these patients maybe a little bit different than another patient? And then, we talk a little bit about the ethics of palliative care, how we bring in spirituality, social work, the entire team. Just your RN. It could be a BSN, or an ADN. As long as you’re a nurse. Actually, technically, even an LPN could take this course. Hi, I’m Carma Erickson-Hurt, and I’m one of the faculty for the RN certificate course and the APRN course that are offered online through Cal State. Very excited to be one of the faculty members. I think these programs are very innovative. They’re very exciting. They’re easy to access, very interactive. I invite you to go check out the website, and take a look and see if it’s what you need. For Registered Nurses who want an in-depth review to prepare for certification, this course is a great way to review and refresh your knowledge. Course work includes activities designed to enhance learning through question/answer sessions, interactive case studies, opportunities for students to apply knowledge in virtual palliative care contexts, and the ability to interact with fellow participants in an online community cohort. Participants will be expected to complete one module each week, with the entire program taking a total of eight weeks. The program is asynchronous, which allows participants to complete the course work on their own time with assignments due at the end of each week. Students can expect to spend eight to ten hours a week on the reading and assignments for the course. All participants who proficiently complete the course work will receive a certificate of completion from the CSU Institute for Palliative Care. The program of study is designed to benefit Registered Nurses (RNs) involved in or interested in the field of palliative care. The only formal prerequisite for taking this program is proof of licensure as a Registered Nurse. If you’re new to online technology, don’t let that keep you away! We have a variety of ways to support you in making your online learning experience successful.